A trial has begun in Ecuador's jungle town of Lago Agrio of the US oil giant ChevronTexaco, which is accused of polluting the country's rainforest and water resources. A billion-dollar lawsuit against the firm was brought by the lawyers for 30,000 Ecuadoreans, who say a Texaco subsidiary - which later merged with Chevron - poured contaminated waste water into open pits. The plaintiffs say the company's activities have destroyed large areas of rainforest and also led to an increased risk of cancer among the local population. ChevronTexaco denies the accusations, and its lawyers say the company had cleaned up the area after drilling the oil. The trial began after almost a decade of legal battles in the United States ended with a US appeals court ruling that the dispute should be heard in Ecuador. Environmentalists hopes the case will set a precedent forcing companies operating in the developing world to comply with the same anti-pollution standards as in the industrialised nations. 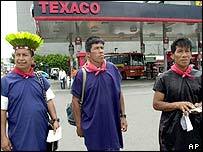 Ecuadorian Indian groups say Texaco - which merged with Chevron in 2001 - dumped more than 18 billion of gallons of toxic materials into unlined pits and Amazon rivers from 1972 to 1992. As a result, they say, crops were damaged, farm animals killed and cancer has increased among the local population. 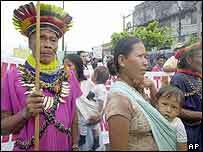 As the trial opened, hundreds of Indians in body paint and feathers marched outside the courthouse in Lago Agrio, about 180 kilometres (110 miles) northeast from the capital, Quito. "It is irreparable damage," Jose Aguilar, a local settler, was quoted as saying by the Associated Press news agency. "Everything has been damaged. People have died. Everything has been lost," Mr Aguilar added. The company has said that after leaving the country it spent $40m in a clean-up project that was inspected and approved by the Ecuadorean Government. The company also has been arguing that environmental damage was minimal and that oil production water had been treated before being released into the environment. But on Tuesday, Judge Alberto Guerra rejected an opening challenge to the court's authority by the oil company's lawyers, who argued that the judge did not have the authority to bring ChevronTexaco trial for alleged damage caused by Texaco. Legal experts say that with appeals and challenges on procedural matters, the case could drag on for months.